"mafi natural wood floors are internationally known for their high-quality, symmetrical 3-layer construction. Here, the top and also the back layers are made with the same wood, the same thermo treatment and initial thickness." Veneer floors are, as the name already suggests, covered with a veneer. This is the top layer, so the wear surface of the plank, and is usually significantly thinner than 2 mm. Thus, a repair on such floors is almost impossible and more specific demands such as pets are particularly challenging for the floor. The veneer is attached to a supporting surface. Then, the counter-move acts as a third layer. Parquet floors or so-called wood floors have a thick wear layer and are generally thicker in construction than veneer floors. In addition to a better overall stability, parquet floors convince due to a longer life span and workability of the wear layer. Unlike as in three-layer parquet floors, in a two-layer parquet the counter-move is usually missing or is replaced by a certain carrier material. However, this results in a lack of stability. Usually, the low construction height is a common factor in the decision to install a two-layer parquet. Especially in renovations and modernisations, there is often insufficient space. For this, we offer a special plank version called the thin plank, which is again constructed in three layers. The counter-move is made from the same wood as the top layer, which gives it extra stability. The standard three-layer construction mostly consists of a top layer, a middle layer and a counter-move. With regard to the top layer, the thickness of the wear layer is a decisive element for the longevity of the floor. 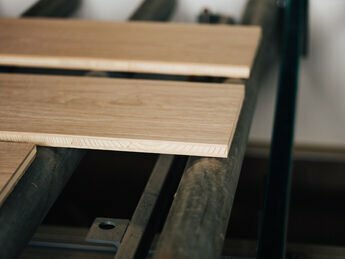 For the middle layer, a robust and yet slightly softer wood should be processed in order to optimally support the top layer, but also to reduce tension, which is especially important in long and wide planks. The back layer is another guarantee for stability but here often only thin, veneer-like back layers can be found. 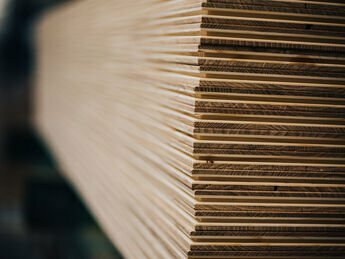 Ideally, the top and back layers are matched in terms of thickness, wood type and thermo treatment. Thus, mafi planks are always this symmetrical three-layer construction. © 2014 mafi Naturholzböden, Schneegattern, Oberösterreich, All rights reserved.